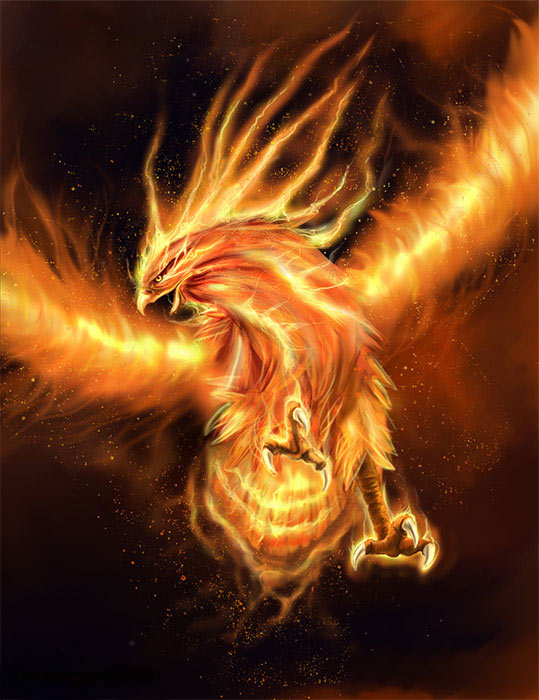 Legend and Mythological Story of the Phoenix. and passion, unattended, is a flame that burns to its own destruction. and like the phoenix rise above its own ashes. The beautiful, legendary bird that lived in Arabia and, according to myth, consumed itself by fire every 500 years. A new, young phoenix — just as breathtaking — sprang from its ashes. In ancient Egypt, the phoenix represented the sun, which dies at night and is reborn in the morning. Greek mythology presents the stunning creature in the early morning — at dawn it bathes in water and sings an enchanting song. So beautiful is this song that the sun god Helios would stop his chariot to listen. There only exists one phoenix at a time. Upon its impending death, it builds a nest, sets itself on fire, and is consumed by the flames. A new phoenix springs forth from the pyre. Early Christian tradition adopted the phoenix as a symbol of both immortality and resurrection. Modern folklore utilizes the magnificant creature as a symbol of renewal, rebirth, and starting anew.